According to the Accrediting Council on Education in Journalism and Mass Communications (ACEJMC), “accreditation in higher education is…public accountability and improvement of academic quality.” ACEJMC is the agency responsible for the evaluation of professional journalism and mass communications programs at colleges and universities. 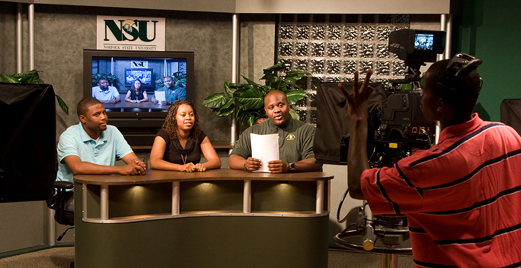 Norfolk State University’s Department of Mass Communications and Journalism is up for re-accreditation with ACEJMC next year. A self-study of the department’s adherence to accreditation standards is due on Nov. 9. Some benefits of re-accreditation are that the accreditation enhances the stature and reputation of a program. Norfolk State goes through a re-accreditation process every seven years with the Southern Association of Colleges and Schools Commission on Colleges (SACSCOC) and visits are made at six-year intervals with ACEJMC. Accreditation by ACEJMC is a measure of the program’s compliance with basic standards and of how well the program achieves its stated mission. ACEJMC does not rank programs or compare them with one another. The ACEJMC accreditation site visit is scheduled for Feb. 19-22.